Reproducing the world in true-to-life images! Creating lenses that help photographers pursue their passion. Optical equipment conveys a variety of information by harnessing the properties of light to reproduce images of objects. The optical technology utilized by such devices as cameras, projectors, office multifunction devices, printers and medical equipment play a key role in supporting the foundations of modern life. 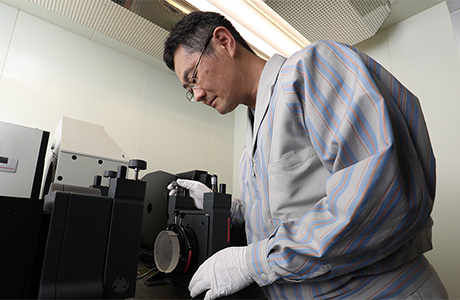 Canon's optical technology is the product of leading-edge techniques ranging from materials development to product design and processing, enabling the Company to create high-precision equipment and products with innovative functions. Production technologies are a vital part of developing materials previously unheard of and give tangible form to phenomena believed to be only theoretically possible, thereby delivering the performance demanded by customers. Of these many technologies, this installment will focus here on Canon's renowned camera lens production that stands at the world's technological forefront. We asked several Canon developers what cutting-edge technology the company possesses, how they were created and what the future might hold. Aspherical lenses Correcting aberration enables images to be faithfully reproduced. What's the purpose of lens polishing and glass molding methods? 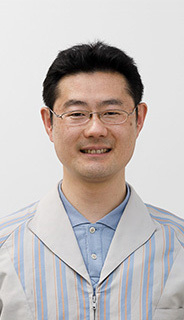 In charge of lens manufacturing process development, he has focused on polishing techniques for such optics as aspherical lenses and free-form mirrors. Motto: I'm here for a reason. "I approach my duty at the lens processing workshop with the keen awareness that I'm here now to discover the causes of problems and find solutions." 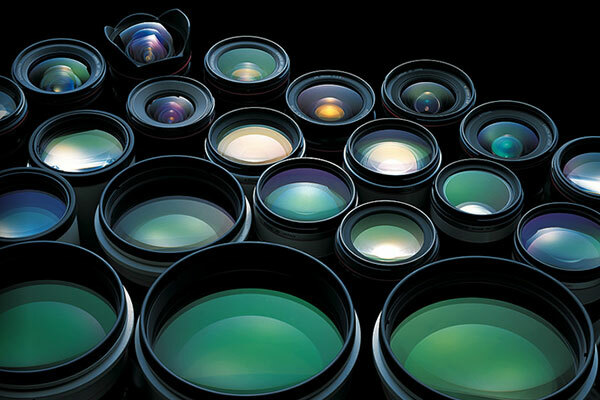 What is an aspherical lens? How is it different from conventional spherical lenses? NakagawaSpherical lenses possess an inherent flaw, in that it's impossible to converge parallel light completely onto a single point. 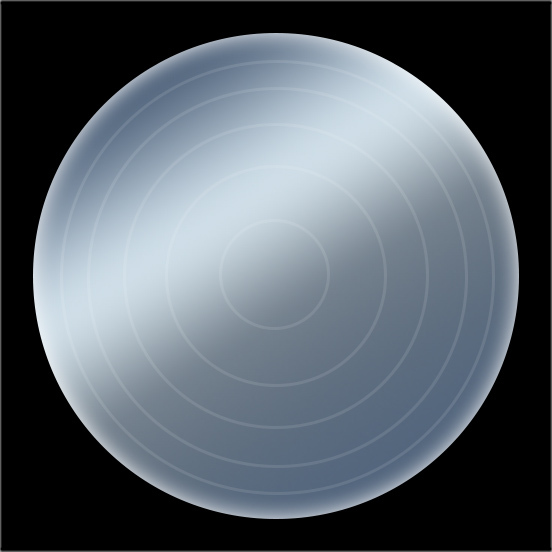 A spherical lens has a rounded surface, which makes light passing through the edges of the lens gather at a point closer to the center of the lens compared with light passing through the center of the lens. The resulting image is slightly blurred; a problem we call "spherical aberration." To correct this spherical aberration, multiple lenses had to be combined in layers. The aspherical lens was developed as a one-piece solution for eliminating spherical aberration. As the term suggests, the surface of the aspherical lens is "not spherical." Its curvature is slightly changed in the radial direction, and if you look at a cross-section of the lens, you'll find some depression in the lens rim. This shape enables light passing through the lens to converge onto one point, thereby producing a sharp, clear image. What kind of technology is used to make aspherical lenses? NakagawaThere are four main approaches to making aspherical lenses: the "grinding and polishing method"; the "glass molding method" to shape glass in a metal mold; the "replica method" to shape a lens by combining glass and plastics; and the "plastic molding method" to shape plastics in a metal mold. Aspherical glass lenses are made either by the grinding and polishing method or glass molding method. Grinding an aspherical lens The basic concept behind processing a spherical lens by grinding and polishing is to transcribe the exact shape of the tool onto the lens material. In other words, transcription is done by rubbing together the tool, which is the inverted shape of the lens you want to make, with the lens material. 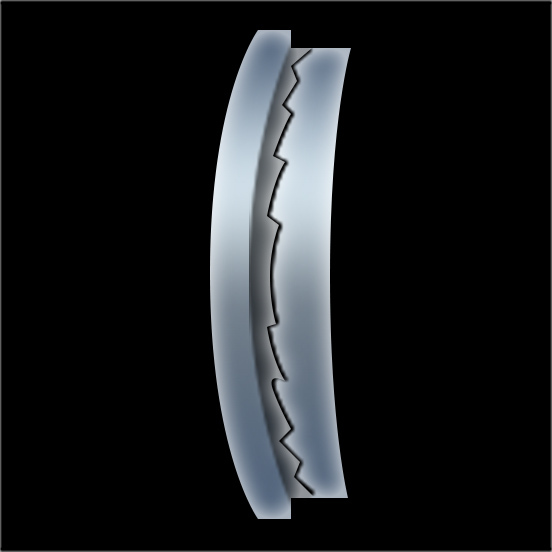 However, an aspherical lens has a complexly curved surface, making it impossible to create such a lens by simply rubbing the tool and the lens material together. In the grinding and polishing method, we use a whetstone, which is a tool incorporating diamonds. The whetstone grinds the lens material as it turns so as to carve out the complex shape of the required aspherical surface. 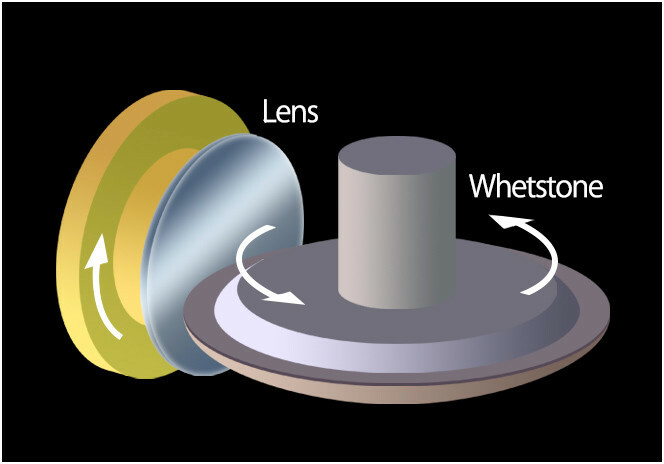 In this case, the precision of the processing machine, which controls the position of the lens and that of the whetstone, directly affects the precision of the lens being made. Thus, an extremely precise lens requires an equally high-precision processing machine. Canon developed its first aspherical lens in the early 1970s. What challenges had to be overcome before mass-production was possible? NakagawaIn order to create aspherical lenses exactly as designed, we first needed a processing machine capable of precision on the required 100-nanometer level. But even though the principle behind the processing had already been established, it took many more years before the processing machines were capable of meeting such strict requirements. Computerized numerical control (NC) machine tools began appearing in the late 1960s, and it finally became possible for us to mass-produce aspherical lenses in the 1970s. In the nearly half a century that's has passed since then we're now able to achieve a level of precision more than 100 times what we could back then. The movements of the grinding machine are quite complex, creating a high-precision shape by moving horizontally as it rotates. After grinding comes the polishing process, but what exactly is the most difficult part of polishing aspherical lenses? NakagawaFirst and foremost, the tool must be of high precision. In the grinding process, diamonds do their job so powerfully that the lens surface comes to look milky. 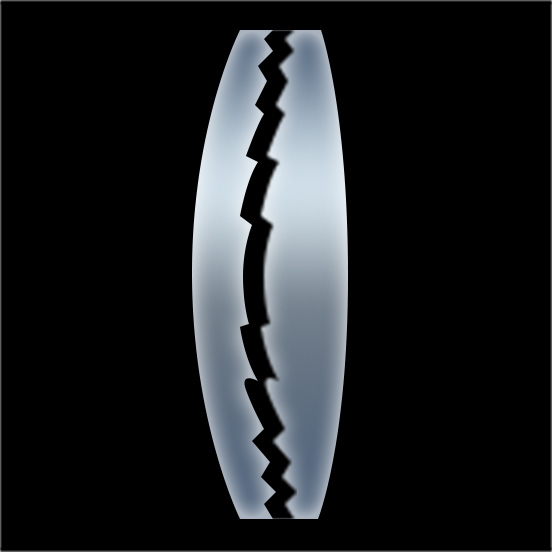 In order to obtain a lens with high transparency, it's vitally important to properly manage the shape of the tool and the conditions of diamonds. 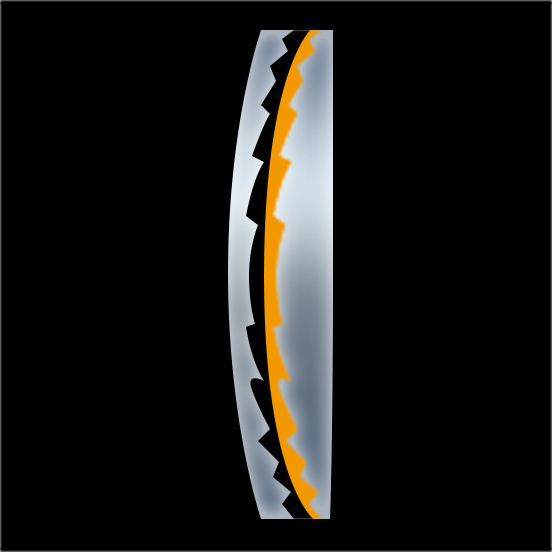 It's true that the larger the tool diameter, the higher the tool's efficiency. However, if you use a tool larger than the lens size, it will make no difference to the grinding and polishing method for spherical lenses, and you're left with an ordinary spherical lenses. Conversely, the smaller the tool size, the easier it is to process complex aspherical shapes. However, that means longer processing times. To achieve the ideal balance between processing time and aspherical grinding and polishing precision, we need a special tool design technology. The next key point is how you operate the processing machine. You won't achieve the required level of precision if you leave everything to the precision of the processing machine. The most challenging part of achieving the required lens precision is to work out an ideal combination between the processing machine, tools and the software that controls the movement of the processing machine. You cannot determine the ideal combination of these three factors unless you identify the causes of errors that result in discrepancies between the lens' design and the final shape after processing. All of us--the members responsible for manufacture at the plant, the equipment development and process development teams--put in countless hours of hard work. I'm sure our success in achieving the precision of our aspherical lenses owes much to our tireless efforts. In charge of plastics and glass forming processes. Motto: Keep digging until you reach the truth. "Instead of focusing only the data in front of me, I prefer to reach keep an open mind as I work towards the cause of a problem." Let me ask you about the glass molding method, a process in which molds are used to manufacture aspherical lenses. What sort of techniques are involved? MiyazawaThis method uses a precision-fabricated aspherical mold which is directly pressed against glass to form a lens. After the glass and the mold for transforming the glass have been set in position, the glass undergoes heating, pressing and cooling processes before it is taken out of the mold. This method's merit lies in its high productivity. It allows us to easily exchange different molds, making it easy to produce various types of lenses. What are the keys to enhancing productivity? 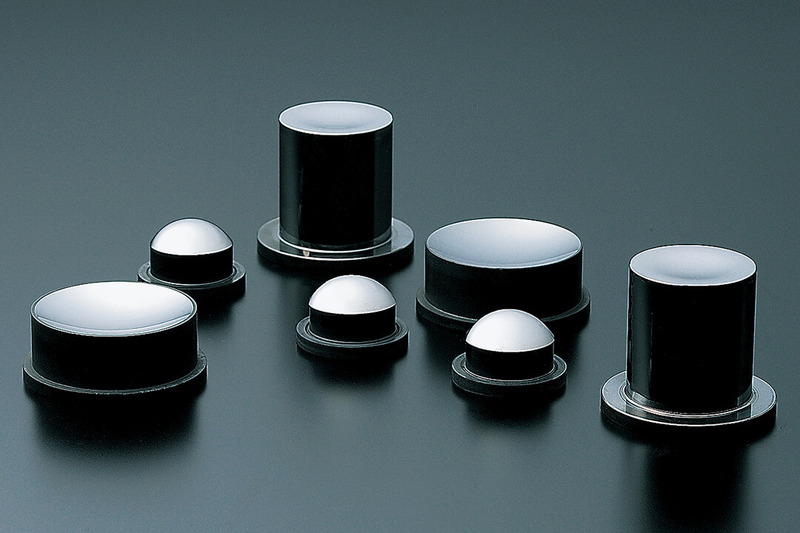 Molds for aspherical lenses MiyazawaWhen pressing glass, we consider three parameters--temperature, time and load. We can raise productivity by determining the ideal settings of these parameters to shorten the time required for processing. In order to do that, we have to figure out how to speed up the processes from heating to pressing and from cooling to removal from the mold while maintaining lens quality. MiyazawaGlass comes in various types and each type has its own chemical composition, so you can't process the different types of glass using the same method. Shape also has a significant effect on the degree of difficulty involved in processing. Therefore, we have to design a process according to the type of glass and its shape. This is the major difficulty involved in the glass molding method. Despite the steady progress being made in glass molding technology, there's still much that we don't understand. For example, it is difficult to quantify what exactly will happen when the glass is pressed under high temperatures, or when the glass is cooled afterward. One day I was struggling with trial and error. It was then that my senior told me, "You have to imagine yourself as the glass." At the time, I thought they were half-joking. But soon after that, I actually tried to imagine what shape the glass would want to take when a load is applied to it. I came to realize the importance of thinking about such problems from the viewpoint of the glass. When I finally managed to solve the problem, I felt as if I had come to understand the feelings of the glass a little better, which made me happy (laughs). Regarding high-performance aspherical lenses, it seems that the development of concave lenses lagged behind that of convex lenses. Was that because of technical difficulties? MiyazawaThere are many types of lenses. For example, some have only convex surfaces or concave surfaces on both sides, while others have a convex surface on one side and a concave surface on the other. Of course, the way a convex lens comes off the mold differs from that of a concave lens. This is why we needed to develop lens manufacturing processes according to lens shapes. While we can anticipate to some extent such shape-related difficulties in the design stage, overcoming these obstacles in the development stage involves continuous trial and error. As users, we have growing expectations that advancements in glass molding technologies will lead to higher-performance lenses. What is the future of this technology? MiyazawaThe glass molding method has limitations regarding what kind of shapes we can design. In the future, we'd like to expand the possibilities of glass molding by increasing the variety of glass materials and shapes. Diffractive Optical (DO) lensesDiffractive Optical (DO) elements are special elements with jagged shapes. 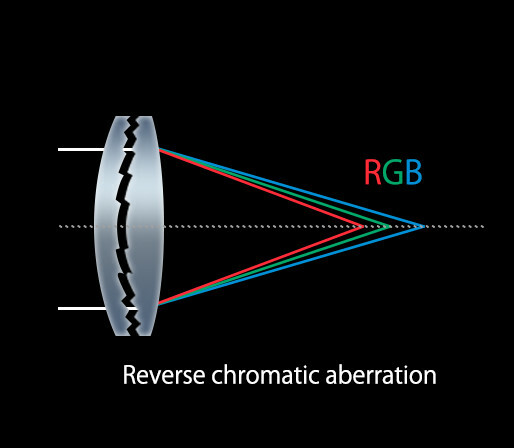 What is an innovative technology that can correct chromatic aberration in a completely new way? In charge of process development, she has studied DO manufacturing methods from elemental development stage to the establishment of mass-production processes. "I believe there are areas in which, even if I don't understand every detail in the theoretical sense, I can learn and grow by working to understand them intuitively." NiwaLight refracts when it passes through a lens. 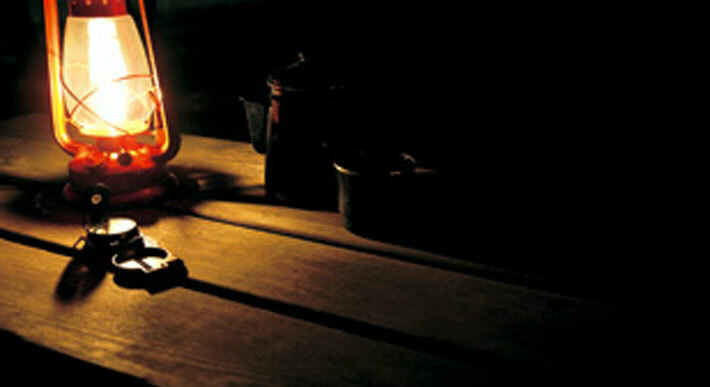 And when encountering an obstacle, light bends around behind the other side of the obstacle. This phenomenon is known as diffraction. 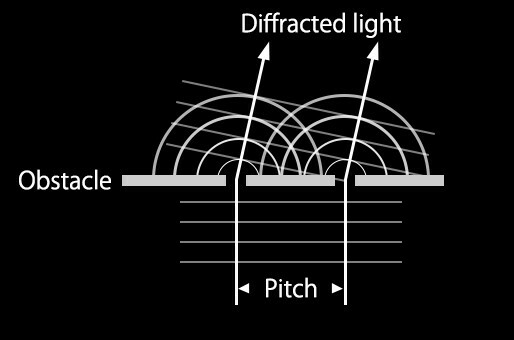 Using elements called "Diffractive Optics," DO lenses are designed to correct chromatic aberration by means of both refraction and diffraction of light. 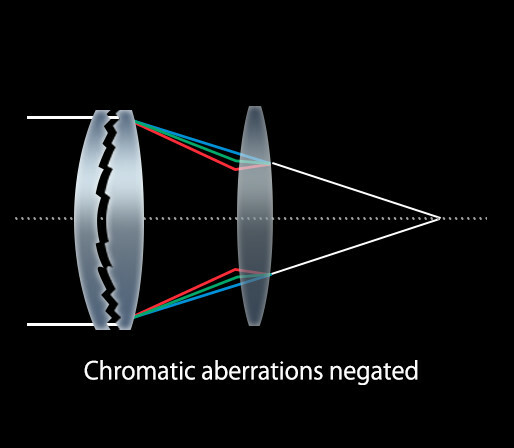 Chromatic aberration in common refraction lenses occurs in a completely opposite manner to that of DO lenses. With the former, images form in the order of Blue → Green → Red, whereas with DO lenses, images form in the reverse order: Red → Green → Blue. 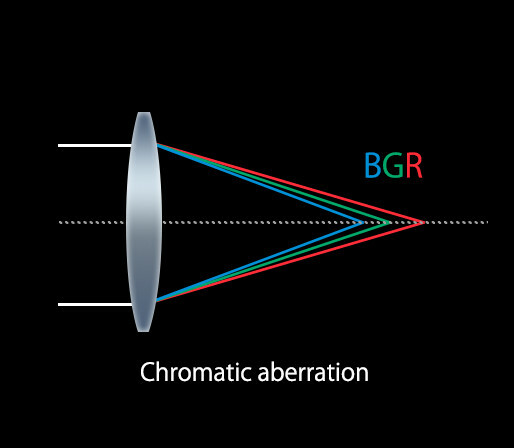 By combining these two completely different lenses, we were able to negate the two contradictory chromatic aberrations. As a result, we are now able to create telephoto and other lenses that are significantly smaller and lighter. So, the DO elements hold the key? NiwaA DO element has a jagged, saw-tooth lattice structure on its surface that diffracts and controls the path of light. 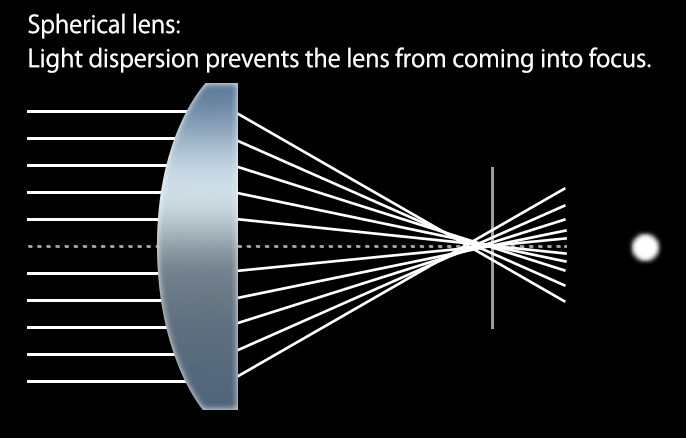 However, DO lenses do not bend light by refraction. They are special lenses in that light rays passing through adjacent ring-shaped slits interfere with each other, thereby eliminating superfluous diffracted light. Have such lenses been around for a long time? NiwaYes, in the sense that there have been elements which can work only with a specific color. One such example is the pickup lens for use with such optical media as CDs and DVDs. However, in 2001, Canon became the first to commercialize this technology in an optical lens that demonstrates high performance across the entire visible spectrum. 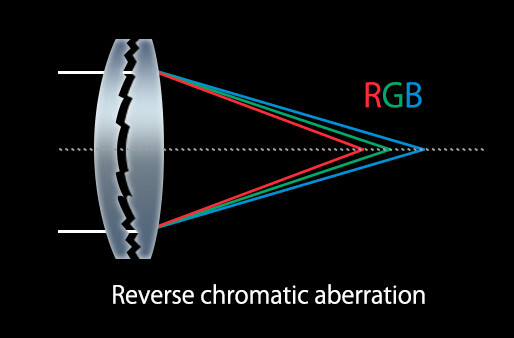 It had long been known theoretically that chromatic aberration correction could be achieved through the opposing effects of refraction and diffraction, but this was the first time that this knowledge was practically applied to a camera lens. Please explain the types of DO lenses and their features. NiwaCanon produces multi-layer (dual-layer and triple-layer) DO lenses and gapless dual-layer DO lenses. 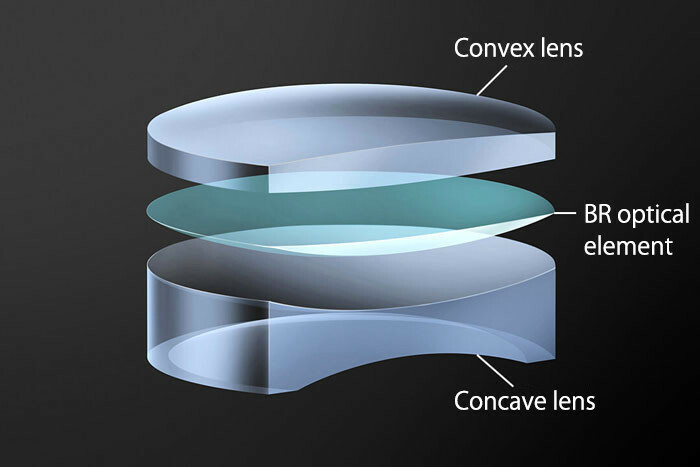 Multi-layer DO lenses come in two kinds of different structures. 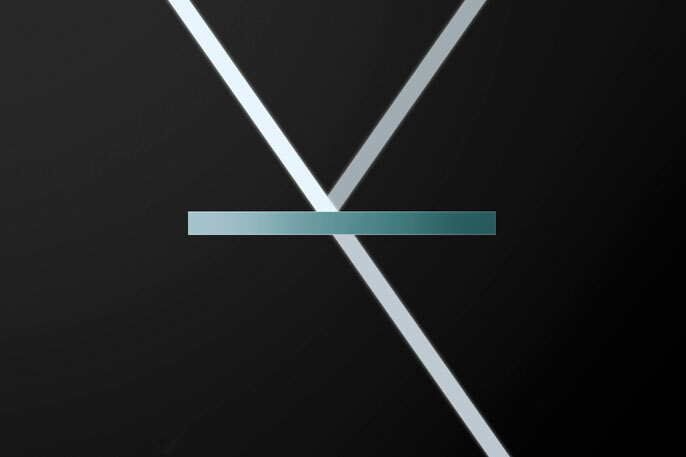 The dual-layer type has an air layer sandwiched between two DO elements. With the triple-layer type, one of the two DO elements is coated with a different material. 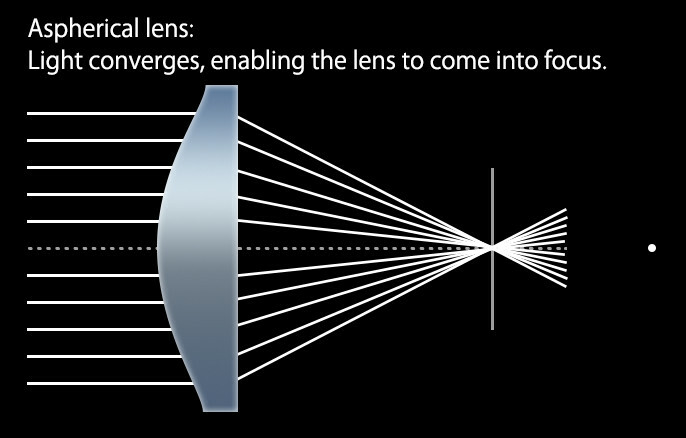 As product development advanced from dual-layer to triple-layer types, it became possible to use DO lenses in zoom lenses in addition to fixed-focal-length lenses. The structure of the gapless dual-layer type is much simpler; A DO element is placed between two materials, leaving no gap. A special resin or resin material is used to make the DO element of this structure, which made it possible to diffract light rays effectively over the entire visible spectrum. What purpose does the special resin or resin material serve? NiwaBy using this material, we're able to create an ideal lens capable of bending 100 percent of light rays by diffraction. By developing original materials that maximize the functionality of DO and developing new optical configurations for lenses based on those materials, we were able to realize completely new types of DO lenses. I guess you must have encountered a lot of challenges in processing such a special material. NiwaThere were actually many things that proved difficult, like how to handle such a unique material, and devising a method to thin it. The lattice structure is formed by spreading the material on the mold and then curing it using UV light. However, we encountered various difficulties in designing this process, namely figuring out how to make the lattice structure form exactly according to specifications. We knew the answers to these problems in theory, but unpredictable phenomena sometimes occurred during actual trials. Solving these issues and making the technology work was a real challenge. But although it was a struggle, I felt it was that much more worthwhile and rewarding. Canon's technological portfolio is vast and diverse, but processing technology alone will not enable a company to create a lens like this. Nor will simply having the materials. Canon's strength lies in the fact that we have possess both, and I'm proud to be a part of that. Diffraction of light occurs when adjacent rays of light separated by a certain distance (pitch), interfere with and intensify each other. The angle at which diffracted light travels varies according to wavelength and pitch interval. The narrower the pitch and the longer the wavelength, the greater the angle at which diffracted light is bent. By taking advantage of these principles and controlling pitch intervals, it is possible to make a lens that focuses light of a certain color onto a specific point. Blue spectrum Refractive (BR) optical elementsBlue light holds the key. Development of the breakthrough optical element that controls blue light began with the creation of a never-before-seen material. 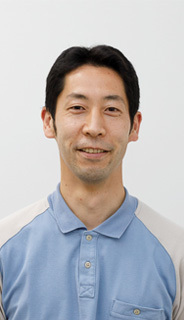 Has been in charge of developing photo-curing organic materials since he joined Canon. Motto: First of all, give it a try. What kind of element is the Blue spectrum Refractive (BR) optical element? The BR lens structure SaitoTerunobu Saito: Natural light, with its wave-like properties, consists of an optical spectrum made up of different wavelengths, each with its own refractive index. 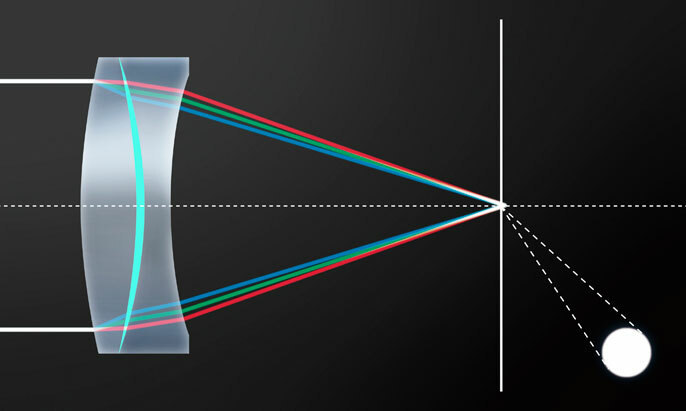 Therefore, ordinary lenses are unable to focus light on a single point to produce a clear image. 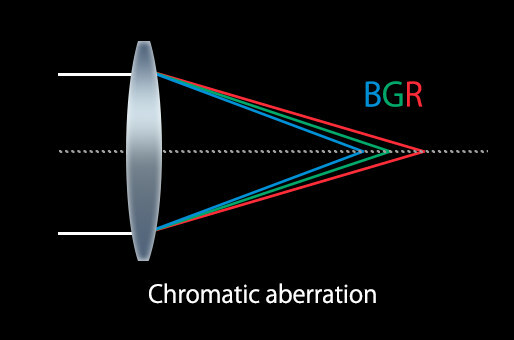 A variety of optical elements have been developed to date for lenses in an attempt to correct the chromatic aberrations that occur as a result. However, especially difficult was the development of lenses that can focus blue light, which is in the short wavelength range. The BR optical element has the ability to target blue light alone and significantly refract it. As such, lenses incorporating this optical element can correct chromatic aberrations at an incomparably higher level than conventional lenses. So much so, it has become possible to obtain high-quality images with the least amount of blur even in astrophotography - a field where expressing each point has traditionally been extremely difficult. 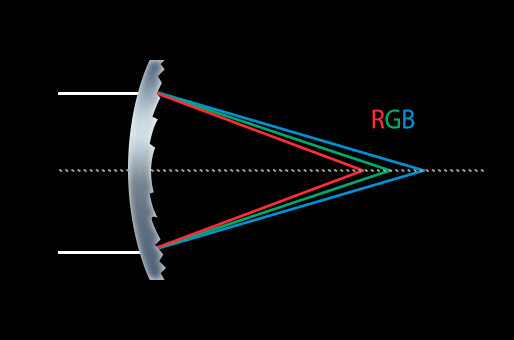 A combination of concave and convex lenses is not enough to correct the blue light wavelength, resulting in different focusing positions for each wavelength leading to colors fringing. The BR optical element is capable of significantly refracting blue light (in the short wavelength region). Employing this element in a lens that combines concave and convex lens elements enables it to focus the whole wavelength region of light on one point. We heard that Canon developed the material used for the BR optical element in-house, is that right? SaitoWe were searching for a solution to correct chromatic aberrations that the lenses available at the time designed using existing technologies couldn’t. It was then that our Design Division suggested we think about a method that could significantly bend blue light. So we began by looking into whether a material capable of that existed. Of the many materials available on the market, some were already known to be able to significantly bend blue light. However, we had to give up on them because they were difficult to apply to lenses. Then we made up our mind to develop our own original material from scratch so that we didn’t have to compromise in any respect. Creating a new material from scratch sounds like an exhaustively long, tough process. Specifically, what did you do? SaitoSince this was our first attempt at creating an organic material in-house starting with its molecular structure, we began by setting up a lab. Then we proceeded to material simulations and actually synthesizing candidate materials to evaluate their properties. We repeated this process over and over again. With a material simulation, regardless of whether a material could be actually synthesized or whether a material could be stable as a substance, as long as you input a value it will invariably come out with a result. If you merely fixate on the desired properties, however, a simulation could lead to unthinkable molecular structures that you have no way of producing. 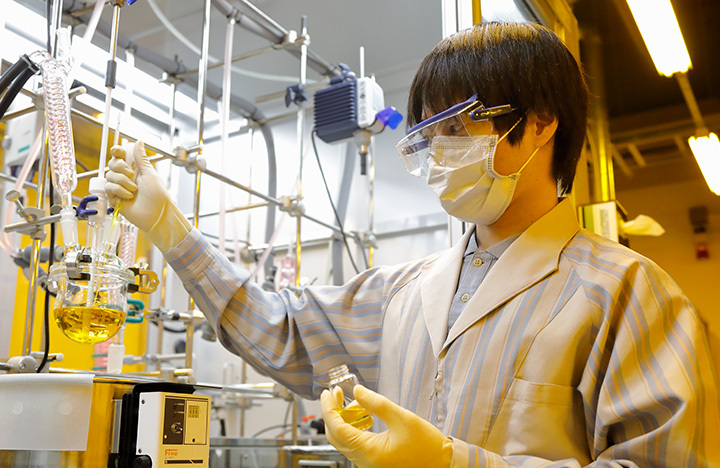 Therefore, we gave thought to the development in various ways: whether a material of this molecular structure could be synthesized this way, whether a material of that molecular structure could be stable under various conditions, and so on. In this way, we narrowed down candidate materials by actually synthesizing them for evaluation. Whenever I reached an impasse, I would go through the catalogues of material and reagent manufacturers page by page while trying to come up with new ideas. While people are likely to pay attention only to the material’s optical properties like its ability to bend blue light, we actually had to design the material taking into account various other factors as well, such as its manufacturing process, safety for the human body, workability when handling the material, and long-term stability. These were integral to the “unprecedented performance” that we sought in designing the material. In this sense, I can proudly say this material embodies our unparalleled enthusiasm for and commitment to quality and performance. I imagine you must've been very happy when you finally completed the material after overcoming all these difficulties. SaitoThe project was actually nothing less than a series of slow and steady efforts, but it was fun as well as challenging and rewarding. When I managed to find the solution to a given problem and achieve sought-after performance, I was practically shouting "eureka!" The sense of achievement in creating something innovative that nobody had ever made before was the greatest experience I’ve had. Since a considerable part of this development project was personally entrusted to me, I did my best to accomplish what I had really wanted to do as a materials developer, instead of merely doing what I was told. This motivated me very much. The field of new materials development is one where you can discover and understand things only after you have given it a try. I’m the kind of person who needs to try something and see for myself that it doesn’t work before I can accept it, so I went out of my way to do things with my own two hands and confirm everything with my own two eyes. Currently, the BR lens has been incorporated into the EF35mm f/1.4L.II USM lens, which has caused a stir among users. Camera magazines have carried articles about delighted users who have said, “It really makes a difference,” and “this lens is amazing!” I'm sure it differs from old models in terms structure and the number of lenses used, but I also assume the greatest difference the adoption of the BR optical element. Is that right? SaitoそThat’s true. The EF35mm f/1.4L.II USM lens of course incorporates several important improvements, but above all, the BR lens allows it to outperform other lenses in its ability to correct chromatic aberration. Eyeing its expanded application in more products, we have already begun R&D efforts for further sophistication and cost reduction of the BR lens. SWC & ASC ? 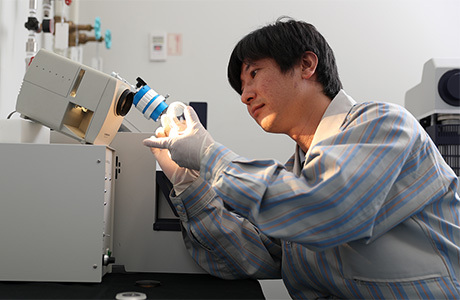 ground-breaking lens coating technologiesThe new SWC and ASC lens coating technologies dramatically reduce the reflective properties of lenses. Let’s take a look at Canon’s industry-leading lens coating technologies. 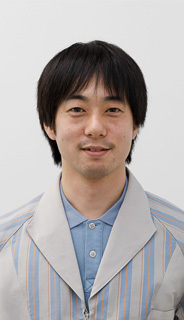 In charge of materials development, he has been engaged in the development of high-performance anti-reflective films. Motto: Never be satisfied with your present situation, always aim higher. First of all, could you please explain the roles and functions of an anti-reflective coating? MakinoAir and glass differ greatly in their refractive indices. Therefore, at the point where the air and glass meet on the lens surface, light is reflected and causes light transmittance to decline. Also, there can occur phenomena like ghosting (light that, after repeating reflection on the lens surface, results in an image containing artifacts that aren't actually there) and flare (intense light like backlight, which is reflected or scattered by a lens or lens barrel, that causes a part of the photo image to become whitish). To prevent such phenomena, light reflection needs to be minimized by coating the lens surface with an extremely thin film. Even so, there were cases that anti-reflective coating failed to work well, depending on such conditions as the incident angle of light. The structure of SWC To enhance the anti-reflective performance of our lenses even further, we took up the challenge of developing a cutting-edge lens coating technology using nanotechnology. The key to preventing the reflection of light is how to control the boundary surface between the outside air and the thin film. In 2008, we began to apply SWC (Subwavelength Structure Coating) technology to our lens products for the first time. 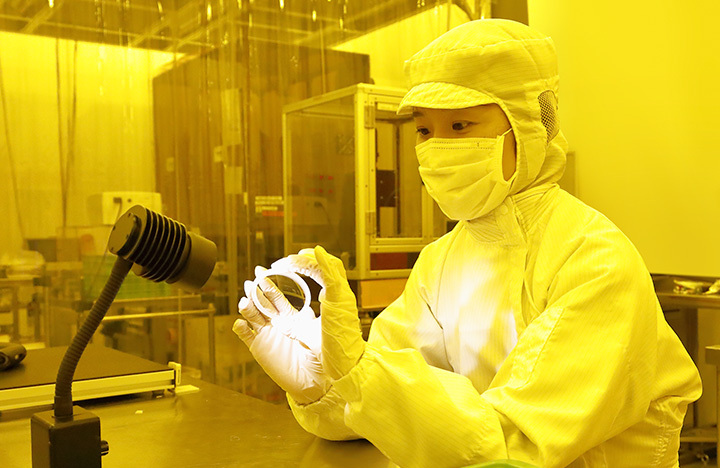 SWC is a ground-breaking technology in that it utilizes countless wedge-shaped structures of nanometer size (even smaller than the visible light wavelength: 380-780nm*) arranged on the lens surface so that light does not react to the boundary surface in effect. This coating also exhibited stellar results for types of light whose reflections were previously difficult to control, such as light entering at an angle, significantly reducing the occurrence of ghosting and flaring. However, the making of nano-sized wedge-like structures particular to SWC requires highly sophisticated, complex processes. Accordingly, our next target project was to develop a high-performance anti-reflective film, the production method of which would be much simpler and require no such difficult-to-make structures as SWC’s. This is how the development of ASC (Air Sphere Coating) technology began. What kind of coating technology is ASC? MakinoDeveloped in 2014, ASC is our latest lens coating technology. It is made up of a film containing air on top of vapor-deopsition films on the lens surface. It significantly reduces light reflection by sandwiching a film containing air between vapor-deopsition films and the outside air, which is highly effective for controlling incident light that comes in at a nearly vertical angle. Since it doesn’t involve any special structures, ASC can be applied to many more types of lens surfaces than SWC. In fact, expanding the degree of freedom in terms of applicable lens surfaces was one of the important objectives of its development. 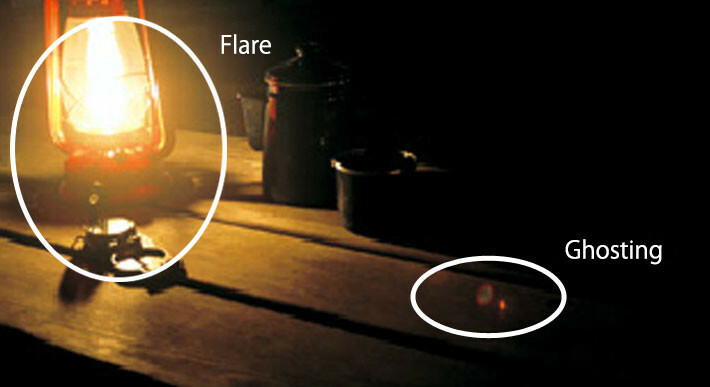 If the lens only has a glass surface with high reflectance the lens reflects much of the incident light. With the application of ASC coating, the lens can reduce light reflection and realize a clear image. I understand that SWC is effective for incident light coming in diagonally while ASC is effective for light coming in almost vertically. Is that correct? MakinoIn principle, wedge structures don’t form a boundary at all whether light comes in from above or sideways. If there is no boundary, then the lens can demonstrate outstanding anti-reflective performance. As such, SWC delivers an exceptional performance not only for light coming in diagonally, but also for light coming in almost vertically. This coating is not specifically for light coming from a certain angle but can effectively deal with light coming from any direction. On the other hand, ASC has a boundary surface. 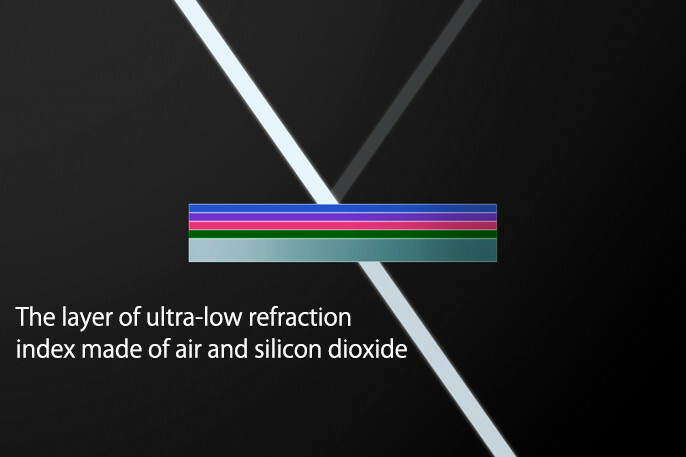 This means the ASC-coated film produces a superior effect on light coming from a near-vertical angle while SWC exceeds ASC in anti-reflective performance for light coming in diagonally. Then, how do you decide whether to use SWC or ASC? 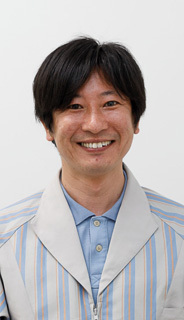 MakinoMakino: Basically, it depends on the type of lens and the particular technologies needed for eliminating flare and ghosting. To put it simply, we mainly use SWC for lenses that require superior anti-reflective performances for incident light coming in diagonally whereas we use ASC for other types of lenses. Please tell us a little bit more about ASC. MakinoWe developed the layer with an ultra-low refractive index for the purpose of minimizing reflection on the boundary between the outside air and the film. In the case of films made of ordinary materials, the average refractive index for films with low refractive indices is around 1.37. 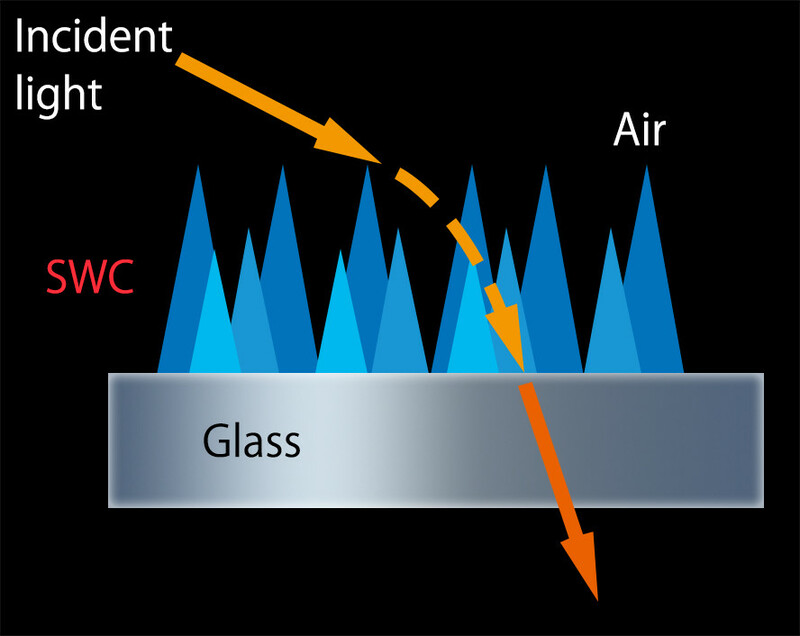 Given the refractive index of air is 1, in order to minimize light reflection as close to that of air as possible, we came to the conclusion that having the film contain air inside it would be the only solution, save for the idea of using wedge structures to eliminate the boundary between outside air and the film, as is the case with SWC. Then comes the problem of how we can have the film contain a good amount of air within it. In the case of ASC, we adopted the method of having the film contain countless fine particles of air. If the size of each air particle is too large or if air particles are distributed unevenly, air itself could become a cause of diffused reflection, degrading the transmittance of light and making the film useless as an anti-reflective film. On the other hand, too large an amount of air contained can make the film vulnerable. So, you could say that the key point of the ASC coating technology is to control the size and quantity of air particles by giving full consideration to the materials in terms of both their composition and the manufacturing method used. As a developer involved in both materials and process development, I went to great lengths to hammer out a solution from both angles while taking a good balance between performance capabilities and how the lenses would handle into consideration. What have you done that you feel is really worthwhile? 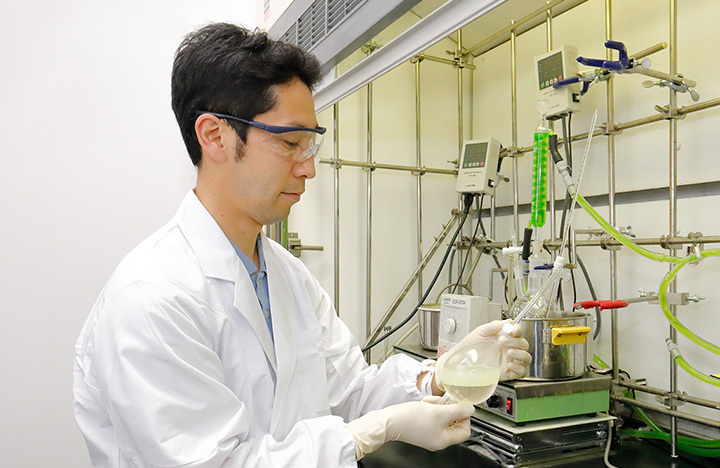 MakinoIn a sense, the development of an anti-reflective film is a seemingly less-exciting job because it concerns an invisible nanometer world; the better performance the film delivers, the less conspicuous its existence becomes. However, let’s take the commercialization of the recently launched “EF11-24mm f/4L USM” lens for example - a lens with a super-wide-angle focal length. Making possible image capture that was previously impossible, to be taken now, the ground-breaking technology behind this fantastic lens is sure to have a real impact on the culture of photography. I was especially happy when I saw how satisfied users of this superb lens were. At this point*, Canon is the only manufacturer in its industry with two proprietary high-performance anti-reflective film technologies like SWC and ASC that totally differ in properties. Our development efforts continue towards making lenses with even higher performance through the clever application of these two lens coatings. Highly advanced, reliable production technologies, which give concrete shape to innovative ideas, are integral to delivering new products into the hands of consumers. Canon’s production technologies span all aspects of product development, from the development of materials through to that of processing, forming and manufacturing equipment. Indeed, the results of Canon’s ground-breaking technological development efforts have contributed greatly to delivering a wide range of truly innovative products to consumers. Behind such impressive achievements, there has always been an invincible pioneer spirit shared by all Canon developers who would never give up, overcoming obstacles through trial and error. In fact, these developers take great pleasure in facing new challenges. This undaunted willingness to take on a challenge must be the driving force behind expanding the scope of their creativity and motivating them to create things that were once considered impossible. Supporting the evolution of optical technology, Canon’s superb production technologies will continue to fulfill photographers’ desires to capture images just as they see them. 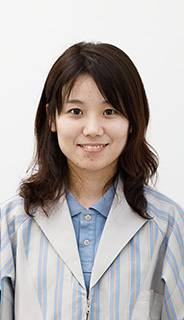 Interviewer/text writer: Yoriko Goto After having worked with a printing company and an editing company, Ms. Goto became independent as a freelance writer. As an industrial writer, she is now active in a wide range of industrial fields such as semiconductors, energy, industrial equipment and environmental issues.